In the context of the HURISTO (Human Rights Storytelling) Project, four webinars on Digital Storytelling have been delivered by Veronique de Leener from Maks. Digital storytelling is a simple and accessible way to tell a story via digital tools. It’s a personal narrative of 4-5 minutes with photos, drawings, a voice off and edited by the storyteller. The aim is to share a story with other people to influence them or to bring them to some action. 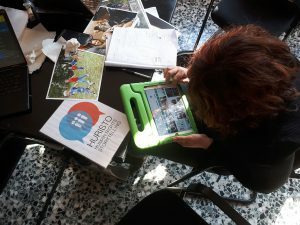 In the HURISTO Project, digital storytelling is the methodology that is implemented to produce digital stories on human rights. Low skilled adult learners increase their digital skills and, at the same time, reflect on fundamental rights. The aim of the HURISTO Project is, indeed, to raise awareness about the European Human Rights Charter as a part of Global Citizenship Education with low skilled adult learners. Digital Storytelling as a boost to adult education: the first webinar was an introduction to digital storytelling. Ethical issues concerning digital storytelling: ethical issues involve the role of the facilitator whose aim is to create a safe environment in the group. You can watch the webinars by following the links above.